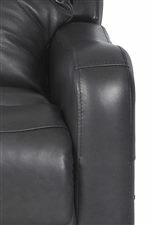 You'll feel totally relaxed with help from the pure gel seat cushion on this gliding reclining chair. Plenty of support comes from the attached back pillows and arm cushions, while outside handle activation makes reclining easy. 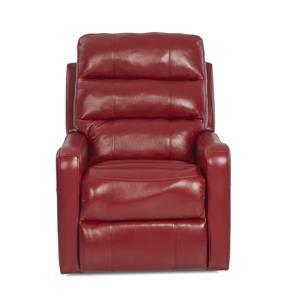 This recliner gives you a cozy seating solution without sacrificing contemporary style. The swivel and glider base makes back and forth movement gently and relaxing. 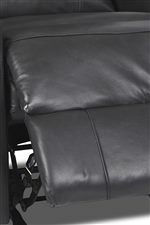 The Striker Contemporary Swivel Gliding Reclining Chair by Klaussner at Hudson's Furniture in the Tampa, St Petersburg, Orlando, Ormond Beach & Sarasota Florida area. Product availability may vary. Contact us for the most current availability on this product. Base Description Hidden recliner base with padded chaise. Padding & Ergonomics Pure gel seat cushion. 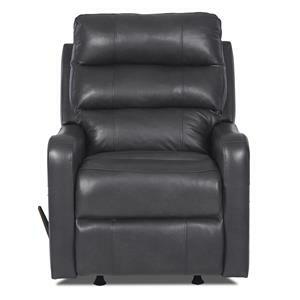 Find extreme comfort without sacrificing contemporary style with the Striker reclining chair collection. Shaped track arms extend up to side accent wings that sit besides attached, tufted pillow top back cushions. The tight seat and full chaise leg pad make the Striker the easiest spot to relax after a long day. The seat also features a pure gel cushion so you'll be supported as well as cozy. Choose from multiple leather options, as well as manual or power handle activation, and find the perfect fit for you in a variety of chair base styles like gliders, rockers, and swivels. The Striker collection is a great option if you are looking for Contemporary furniture in the Tampa, St Petersburg, Orlando, Ormond Beach & Sarasota Florida area. Browse other items in the Striker collection from Hudson's Furniture in the Tampa, St Petersburg, Orlando, Ormond Beach & Sarasota Florida area.